Special Duties (Radio Counter Measures) – Twelve Special Duties Operators (SDOs), were posted TO 462 Squadron Foulsham in early 1945, to operate the Special Top Secret Equipment used in Radio Counter Measures. Only a select number of the Squadron's aircraft were fitted with this equipment. Some Ops were described as Protective Patrols (PP), others as Special Duties. These RCM/PP Ops commenced in mid-March 1945 and continued until early May 1945. The SDOs were not permanently assigned to any one crew, however some flew more than one Op with a particular crew. Most were RCAF, a few were RAF or RAFVR, and only one was RAAF. They were fluent in the German language so were able to listen in on Luftwaffe transmissions and broadcast to them if necessary. Sometimes they were the 8th member of crew. However on several Ops when WINDOW was also released by an 8th member of crew, the SDO was the 9th crew man. Names have been extracted from the Operation Record Books Form 540 (Postings IN and Postings OUT) and from Forms 541 Operations. However many variations occurred for the same person's initials, surname and Service Number. The arrival of nine of the first batch of SDOs were not recorded in the ORB – was this an error of omission? or have pages been lost? Please make contact if you are able to make corrections, or if you can provide further information or photos. Thanks go to David Champion, researcher of 101 Squadron, who recognized names and Service Numbers of several ABC Operators who had been posted from 101 Squadron. Additional information is now included in Tables 1 and 2 below (updated 6 Feb 2017). Table 1: SDOs, RCM – with Ops (may contain errors). Ten RCAF and RAFVR personnel, some with names of possible German descent, were posted TO 462 Squadron during April 1945, but they were not listed in any Ops prior to cessation of hostilities. Information received from David Champion indicates that several were posted FROM 101 Squadron, where they had been ABC Operators for RCM. Their names and details are included in the following table. The 101 Squadron ORBs also have variations in initials, and spelling of surnames, as do the 462 Squadron ORBs. From David: ..... "By the time ABC operators were posted to 462 Squadron, their ABC training would have been at RAF Ludford Magna. ABC started with trials at 101 Squadron in August 1943. The ABC operators were German speakers but they did not actually converse with the German Pilots or other personnel. They needed the ability to differentiate between German and other allied languages, e.g. Czech and Polish. ABC Operators wore their usual "trade" wing on their uniform." Table 2: SDOs – RCM – No Ops (may contain errors). Reference sources – Australian WW2 Nominal Roll; National Archives of Australia (A9301 Service Files, Aircraft Loss Files, 462 Squadron Operational Record Book); London Gazette; The Air Force List January 1945; The Air Force List July 1945; David Champion (Researcher of 101 Squadron); or from sources as noted in the text. Previously served at 101 Squadron as ABC Operator for RCM. Surname CLEYN had been anglicized from KLEIN. In the 462 Sqdn ORB, his name had been recorded on arrival as O C CLYEN J.199620; on his one Op as C C CLYN J.94117; and on departure as D L Cleyn J.94117. 1. 02 May 1945 – Halifax PN423 Z5-I, Britt Crew 47; as 8th member of crew to operate the "Special Equipment"; Protective Patrol and Carpet Jamming with Window Force, target Flensburg. 1. 13 March 1945 – Halifax NA240 Z5-V, Anderson Crew 45; as 9th member of crew to operate the "Special Equipment"; Spoof Raid; 8th crewman R G Irminger to dispense WINDOW; target Frankfurt. 2. 30 March 1945 – Halifax NA240 Z5-V, Scott Crew 64; as 9th member of crew to operate the "Special Equipment"; Spoof Raid; 8th crewman R G Irminger to dispense WINDOW; target Stade. 3. 14 April 1945 – Halifax MZ426 Z5-? (probable error for PN426 Z5-O) Sherren Crew 50; as 8th member of crew to operate the "Special Equipment"; Protective Patrol with Main Force, target Potsdam. 1. 23 March 1945 – Halifax NA240 Z5-V, Anderson Crew 45; as 9th member of crew to operate the "Special Equipment"; Spoof Raid; 8th crewman D G Patterson to dispense WINDOW; target Ruhr. 2. 10 April 1945 – Halifax PN426 Z5-O, Frazer Crew 56; as 8th member of crew to operate the "Special Equipment"; Protective Patrol with Main Force; target Leipzig. 3. 22 April 1945 – Halifax PN426 Z5-O, Frazer Crew 56; as 8th member of crew to operate the "Special Equipment"; Spoof Raid; target Heligoland. 4. 02 May 1945 – Halifax MZ308 Z5-S, Anderson Crew 45; as 8th member of crew to operate the "Special Equipment"; Protective Patrol and Carpet Jamming with WINDOW Force; target Flensburg. 1. 15 March 1945 – Halifax MZ308 Z5-S, Boyd Crew 40; as 9th member of crew to operate the "Special Equipment"; Spoof Raid; 8th crewman S E Tills to dispense WINDOW; target Münster & Hagen. 2. 04 April 1945 – Halifax PN426 Z5-O, Smith Crew 51; as 8th member of crew to operate the "Special Equipment"; Spoof Raid; target Berlin. 3. 14 April 1945 – Halifax MZ308 Z5-S, Boyd Crew 40; as 8th member of crew to operate the "Special Equipment"; Protective Patrol with Main Force; target Potsdam. 4. 02 May 1945 – Halifax PN430 Z5-W, Cairns Crew 69; as 8th member of crew to operate the "Special Equipment"; Protective Patrol and Carpet Jamming with WINDOW Force; target Flensburg. Above: John Edward Geehman, 435052 RAAF, undated but probably at enlistment on 11 March 1943, at 1 Recruiting Centre, Melbourne; single, aged 19 years 11 months. 2 Ops as SDO for RCM at 462 Squadron, 10 hours 50 m Operational Flying. 2. 25 April 1945 – Halifax PN426 Z5-O, Paull Crew 53; as 8th member of crew to operate the "Special Equipment"; daylight Carpet Jamming, target Wangerlooge (sic, Wangerooge), Heligoland (Frisian Islands). He seems to have been the only Australian (RAAF) in the role of Special Duties – Radio Counter Measures, at 462 Squadron. 58th Aust Inf. Batt'n, from 21 January 1942, discharged to join RAAF. 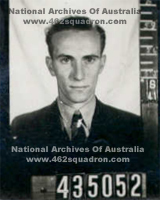 In his Application for Air Crew, RAAF, he recorded that he had studied German and French with first-class Passes for his Intermediate Certificate; French for his Leaving Certificate; and French for his Public Service Examination. His German would have assisted in his role of Special Duties RCM, however his RAAF Service File does not mention where he received training in that role – maybe it was during his posting to 10 (O) AFU. (Cropped from the photo of the crew of Halifax DK188 MP-J). Above: Flight Sergeant John Heggarty, 1238295, RAFVR, just prior to take-off on 27 July 1943, in Halifax DK188 MP-J, while posted to 76 Squadron RAF, Holme-on-Spalding Moor, Yorkshire. His age at that time was 20 years and 11 months, just a few weeks before his 21st birthday (birth date 13/08/1922). His crew position was Rear Gunner. Within hours of this photo being taken, the aircraft had been attacked by night fighters, taking out one port engine; one of the crew had been killed, another injured, and John seriously injured; the Halifax crash-landed at Shipdham on return. 1. 24 March 1945 – Halifax MZ308 Z5-S, Ball Crew 59; John as 9th member of crew to operate the "Special Equipment"; 8th man Ronald George Irminger 437308 RAAF, to dispense WINDOW; Target Ruhr. When in the OPLADEN area, the aircraft was attacked by an Enemy fighter aircraft, identified by the rear-gunner as a FW.190. The enemy fighter closed in to 400 yards to attack; the rear-gunner opened fire; hits were observed in the neighbourhood of the engine; and the FW.190 was claimed as damaged by R/AG M J Hibberd. John was the SDO-RCM for the Ball Crew 59, in Halifax NA240 Z5-V, which failed to return from a Protective Patrol with the Main Force to the target Leipzig, on the night of 10 April 1945. The aircraft crashed at Zaasch, near Delitzsch. Seven of the crew, including John, were killed in the crash. The sole survivor was Rear Gunner M J Hibberd. 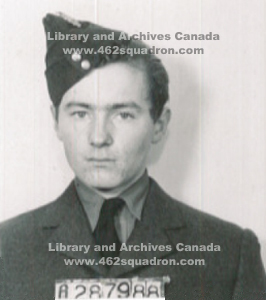 John Heggarty – photos, personal information; service and operational details; injury on Op on 27 July 1943 (76 Squadron, Elder Crew, Halifax DK188 MP-J), and "Mention in Despatches"; family genealogy. St Clement Danes – Book of Remembrance. 1. 18 March 1945 – Halifax MZ308 Z5-S, Uther Crew 26; as 9th member of crew to operate the "Special Equipment"; Spoof Raid; 8th crewman G Fink to dispense WINDOW; target Kassal (sic. Kassel). 2. 08 April 1945 – Halifax NA240 Z5-V, Sherren Crew 50; as 8th member of crew to operate the "Special Equipment"; Spoof Raid; target Schönebeck. Landed at Wickenby. 3. 02 May 1945 – Halifax PN442 Z5-H, O'Sullivan Crew 43; as 8th member of crew to operate the "Special Equipment"; Protective Patrol with WINDOW Force; target Flensburg. 1. 27 March 1945 – Halifax NA240 Z5-V, Grant Crew 62; as 9th member of crew to operate the "Special Equipment"; Spoof Raid; 8th crewman J F Wall to dispense WINDOW; target Bremerhaven. 2. 13 April 1945 – Halifax PN426 Z5-O, Sherren Crew 50; as 8th member of crew to operate the "Special Equipment"; Protective Patrol with Main Force; target Kiel. 3. 16 April 1945 – Halifax PN426 Z5-O, Grant Crew 62; as 8th member of crew to operate the "Special Equipment"; Protective Patrol with Main Force; target Schwandorf. 4. 23 April 1945 – Halifax PN426 Z5-O, Frazer Crew 56; as 8th member of crew to operate the "Special Equipment"; Carpet Jamming with WINDOW Force; target Lübeck. 2. 08 April 1945 – Halifax PN426 Z5-O, Frazer Crew 56; as 8th member of crew to operate the "Special Equipment"; Protective Patrol with Main Force; target Hamburg. 3. 10 April 1945 – Halifax MZ457 Z5-Y, Cairns Crew 69; as 8th member of crew to operate the "Special Equipment"; Protective Patrol with WINDOW Force; target Plauem (sic, Plauen). 4. 14 April 1945 – Halifax MZ457 Z5-Y, Scott Crew 64; as 8th member of crew to operate the "Special Equipment"; Protective Patrol with Main Force; target Potsdam. 1. 16 March 1945 – Halifax NA240 Z5-V, Ball Crew 59; as 9th member of crew to operate the "Special Equipment"; Spoof Raid; 8th crewman S E Tills to dispense WINDOW; target Hanua (sic, Hanau); landed away at Watton. 2. 04 April 1945 – Halifax NA240 Z5-V, Frazer Crew 56; as 8th member of crew to operate the "Special Equipment"; Protective Patrol with Main Force; target Hamburg. 3. 18 April 1945 – Halifax PN426 Z5-O, Scharer Crew 54; as 8th member of crew to operate the "Special Equipment"; daylight Carpet Jamming Patrol with Main Force; target Heligoland. 4. 25 April 1945 – Halifax PN423 Z5-I, Langworthy Crew 34; as 8th member of crew to operate the "Special Equipment"; daylight Carpet Jamming, target Wangerlooge (sic, Wangerooge); 9th crew member Group Captain C V D Willis DSO, DFC, 33354 RAF as 2nd Pilot (Station Commander of RAF Foulsham). 2. 08 April 1945 – Halifax NA148 Z5-Z, Grant Crew 62; as 9th member of crew to operate the "Special Equipment"; Spoof Raid; 8th crewman G P Farrell to dispense WINDOW; target Schönebeck. 3. 09 April 1945 – Halifax MZ457 Z5-Y, Cairns Crew 69; as 8th member of crew to operate the "Special Equipment"; Protective Patrol with Main Force; target Kiel. 4. 14 April 1945 – Halifax RG432 Z5-A (sic, error, this aircraft had been written off, 04 April 1945, replacement was PN427 Z5-A); Anderson Crew 45; as 8th member of crew to operate the "Special Equipment"; Protective Patrol with Main Force; target Potsdam. Hit by FLAK, forced landing at Liege, France, Pilot injured, aircraft total loss. 1. 27 March 1945 – Halifax MZ308 Z5-S, Boyd Crew 40; as 9th member of crew to operate the "Special Equipment"; Spoof Raid; 8th crewman L G Edwards to dispense WINDOW; target Bremerhaven. 2. 13 April 1945 – Halifax RG432 Z5-A (sic, error, this aircraft had been written off, 04 April 1945, replacement was PN427 Z5-A); Grant Crew 62; as 8th member of crew to operate the "Special Equipment"; Protective Patrol with Main Force; target Kiel. 3. 16 April 1945 – Halifax PN430 Z5-W, Boyd Crew 40; as 8th member of crew to operate the "Special Equipment"; Protective Patrol; target Pilson (sic. Pilsen). 4. 22 April 1945 – Halifax PN430 Z5-W, Boyd Crew 40; as 8th member of crew to operate the "Special Equipment"; Spoof Raid; target Heligoland. He had also been recorded as GORMAN in 101 Sqdn ORBs. from former rank of Flight Sergeant, Service No. 1379295. 13 September 1945 – promoted to rank of Flying Officer. (In 101 Sqdn records as Robert/Bob, also Daniel, also HOFFSTETTER). he passed away in 1983. 23 April 1945 – Commissioned, as Pilot Officer 199910, from rank of Sergeant, 1896587 (the relevant paperwork seems not to have reached 462 Sqdn Records, as he was only recorded as Sergeant). Table of Radio Counter Measure (RCM) Ops, by Date and RCM Aircraft Serial Number. Names are those of the Special Duties Operators (RCM) as detailed in previous section. Entry in bold red indicates loss of aircraft. Note that this Table only records the RCM flights by the listed aircraft. It does not include Ops where the those aircraft were used for "WINDOW" Ops; or for bombing; or other flights. It does not include Training flights. e.g. 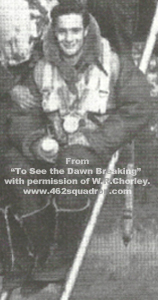 03/03/45 - Sqdn ORB Form 540 - "During the afternoon ONE training cross country flight was carried out by P/O A.D.Ball. This flight was also the first training flight for the A.B.C. Special Duty Operators, and the first time that A.B.C. aircraft had flown in this Squadron." Rear Gunner M J Hibberd's Log Book – "Halifax III Z5-S, Pilot F/O Ball, Day cross country training exercise; Flight time 4 hrs 25 minutes". MZ308 Z5-S was the first RCM aircraft in use by 462 Squadron. NA240 and MZ308 were the first in use for RCM Ops. NA240 and PN426 were the most often for RCM Ops (10 each). 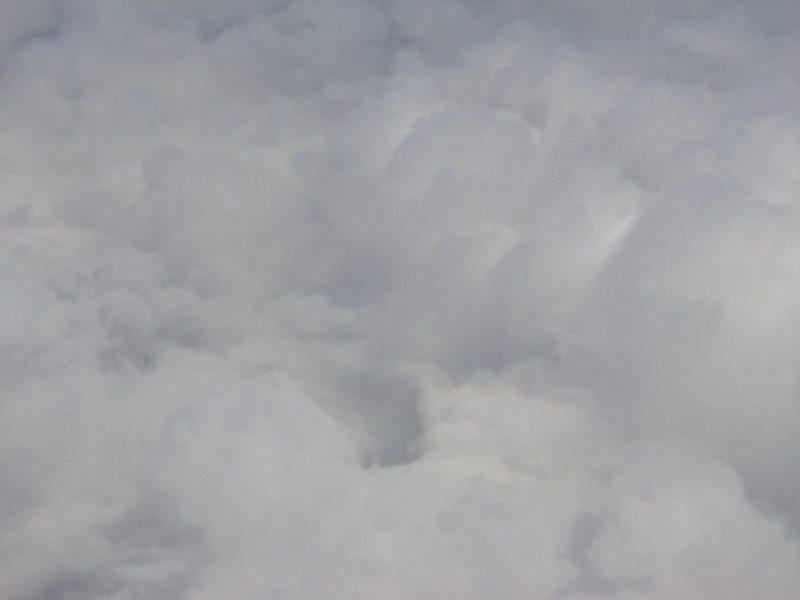 13 and 14 April - errors in recording of aircraft in use. Refer also to the Halifax page for a photo of NA148 Z5-Z, and a painting of PN426 Z5-O. However neither show the extra aerials fitted to RCM aircraft, so are depicted before conversion to RCM usage. That page also has details of the 10 Ops for NA240 Z5-V.